Go read Doug Bailey's piece in Boston magazine, because any time a media strategist for one of the most media-dysfunctional franchises in sports starts telling tales out of school, it's well worth your time. Especially when Bailey's former employer is reportedly furious about it. 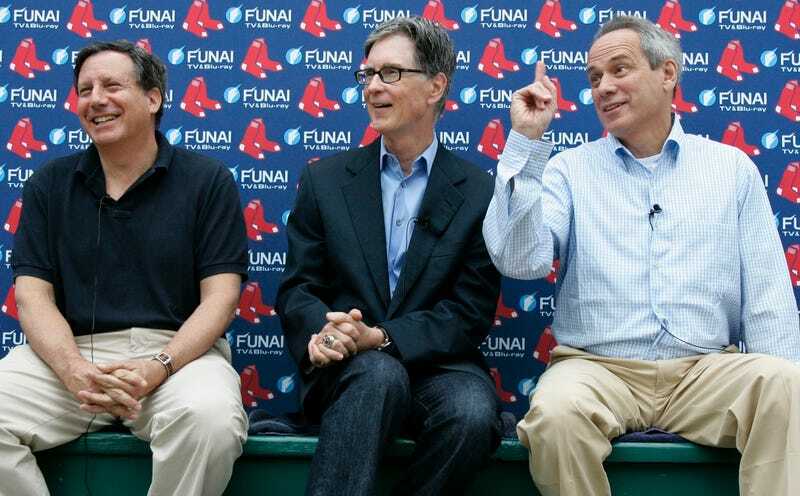 • With the price to buy the franchise skyrocketing, Werner and Otten were muscled out by John Henry, Larry Lucchino, and the New York Times group. Otten was eventually dropped altogether, though not before a few clumsy overtures at staying involved, like showing up uninvited to board meetings and arriving at Spring Training in full Red Sox uniform. Bailey doesn't say it, but it's clear that from the start the Red Sox franchise was doomed to a media feeding frenzy because there are too many owners, and they all enjoy talking to the press. • Selling this out-of-town ownership group to a provincial Boston was a challenge (shades of the Fenway Sports Group's takeover of Liverpool). A major coup came during the new ownership group's whistle-stop tour of New England. The locals were eating out of the palms of the newcomers, as they handed out bags of "Fenway Infield Dirt" to those in attendance. It wasn't actually dirt, but rather the synthetic clay "Turface." And it had never actually been used at Fenway. Didn't matter; the little baggies filled with ochre powder became collector's items. My understanding was that it was Epstein himself who'd wanted to back out of the deal, but that he and Lucchino had cooked up a face-saving cover story that involved upper management supposedly overruling the trade. Soon after, I was in Lucchino's suite overlooking the park during a rare weekday afternoon game, watching Epstein being interviewed on TV about the deal. Epstein put the blame for its collapse squarely on Lucchino's shoulders, which sent the CEO into red-faced paroxysms. Lucchino apparently wasn't expecting to be so directly and completely thrown under the bus. The issue would soon rise again, just after the season ended, and become the centerpiece of Epstein's decision to abruptly quit the team on Halloween of 2005 (the famous gorilla-suit escape). When Epstein agreed to come back three months later, one of his conditions was that Lucchino's daily media meetings be shut down. Epstein had always had a standing invitation to attend those meetings but never came, apparently believing we were spending our time devising ways to bolster Lucchino's image and undercut his. • In 2003, after the explosion of the space shuttle Columbia, the Red Sox invited two astronauts to come throw out the first pitch. The game was delayed by rain, and the astronauts huddled in the dugout waiting. Nomar Garciaparra approached Bailey asking who the two women were. When told they were astronauts, he had some questions. "Hey," Nomar replied, "I saw this show on Fox that said we never really went to the moon. The whole thing was faked. Can I talk to her about that?" "Sure," I said, eager to witness this conversation. Coleman diplomatically handled the inquiry from Nomar. "I've heard about that," she said, "but it would have to be an enormous conspiracy." "Did you see the show?" he quickly rejoined. "It was really convincing…. I don't know." She hadn't seen the show and looked plaintively at me as other players began to join the conversation. "Hey," I said, trying to change the subject. "Cady is going to spend six months on the International Space Station. Talk about training for the big show." Intrigued, Nomar asked about the size of the space station. "It's really big," Coleman said. "Is it as big as Fenway Park?" Nomar asked. "No, not that big," Coleman replied. Then she started looking around for ways to illustrate the dimensions of the orbiting vehicle. "How far is it from home plate to first base?" she finally asked. About six players yelled in unison: "Ninety feet." "It's about that size," she told them. "That's not big," Nomar said. "That's small." • In 2005, the owners were debating renovating Fenway Park or knocking it down and building a new stadium. Within the ownership group, some wanted to present it as an ultimatum: "We'll only stay and renovate Fenway if we receive taxpayer assistance," Bailey recalls. Lucchino overruled that, opting for a lighter touch. The team would promise to say, and offer to help the state with the costs of improvements. Implicit in that phrasing: that the state would contribute its share. Lucchino was probably right to be confident. Five years earlier, the Massachusetts legislature had approved $300 million in taxpayer-funded improvements. To drum up some press before the official announcement this time, the plan was leaked to the press. The Boston Globe did not react favorably; the front page headline read "No Public Money for Red Sox." In the end, taxpayers would kick in less than $100 million. • John Henry was aloof with the help. Bailey describes an entire day spent with the principal owner: driving to and from Lowell to watch a Spinners game, chatting about the team and their families. It was a really enjoyable day, and my impression of Henry changed dramatically because of it. Two weeks later I ran into my new friend at an event at Fenway Park. Walking toward me, he extended his hand and offered a limp handshake. "Hi," he said, introducing himself, "I'm John Henry."